Educators who are working in family learning are helped by the fact that often a proportion of their children will already have used K'NEX at school or at home, and will be able to help adults and other children who are new to K'NEX to get started. ♦ Children, parents and grandparents, both male and female, all enjoy working with K'NEX. ♦ Many family learning practitioners say they have a problem in attracting fathers into their family learning sessions. K'NEX can help overcome this. ♦ Providing K'NEX challenges can also be a good way of attracting hard-to-reach families. ♦ K'NEX can be used successfully with all ages of children, from age 5 upwards. Kid K'NEX is also available for 3-7 year olds. ♦ Using K'NEX in a family learning setting helps both children and adults to develop essential workplace skills in technology, innovation, problem-solving and teamwork. ♦ K'NEX can also be used very effectively alongside other forms of family learning, such as family literacy, family numeracy and family IT sessions, and can help reduce drop-out rates in these settings. ♦ Once a family learning centre has invested in sufficient K'NEX to meet their needs, the equipment can be used over and over again, with a different K'NEX challenge being set each time (see Challenges). ♦ K'NEX is portable enough to be transported around a number of Family Learning centres, or to family events, in the boot of a small car. 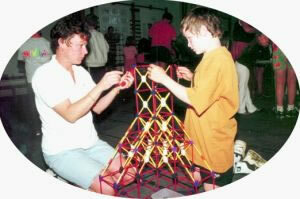 ♦ A range of K'NEX challenges can be provided within a topical Theme, such as "Olympic Games" or "Theme Parks". 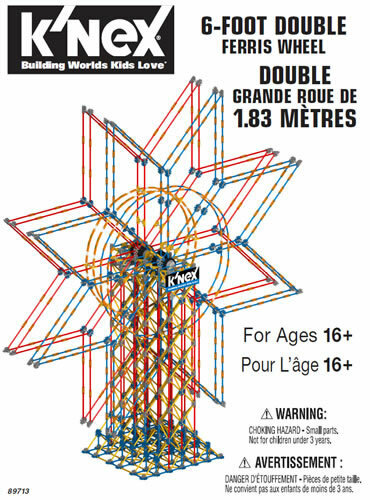 ♦ K'NEX is relatively low cost. The main curriculum areas for K'NEX are shown in the Curriculum pages. The versatility of K'NEX means that the same equipment can be used successfully with all ages from 5 up to adult. If you have children aged 3 and 4 in your family learning sessions, we would also advise purchasing some Kid K'NEX. ♦ "Using K'NEX in Family Learning"
♦ "101 K'NEX Maths activities"
The ideal location for K'NEX family learning within one of the above venues would be a large open-plan room or area, with groups of tables and chairs each seating 6 to 10. It is also helpful to have a Reception desk to welcome families when they arrive. There are many events held around the world each year which are based on K'NEX and/or Kid K'NEX, or in which K'NEX or Kid K'NEX plays a major part. These vary from events in local schools lasting no more than an hour, to holiday camps that run throughout the summer holidays. 1. Who will the event be for? Children only? Adults only? Children and adults together? 2. What will the age of the children and adults be? 3. What is the prior experience of participants likely to be? Eg will they have used K'NEX before? 4. How will you fund the event? From fees charged (eg £1 per participant)? Existing budgets? Fundraising? Grants? 5. How long will the event run for? An hour? A day? A week? A whole school holiday? 6. Will your event be "closed access" (ie for a group who will all start the event at the same time, and participate together), or "Open access" (for participants who may drop in at any time they like, and stay for as long as they like). 7. Where will the event be held? Does it have a large open plan room with tables and chairs? Toilets? Wheelchair access? 8. If you are running an Open Access event, can you provide a Reception desk to welcome visitors? 9. Does the venue have easy access for visitors arriving by car, public transport, on foot, etc? 10. Will you be asking participants just to build K'NEX models from instructions, or (we hope!) setting them K'NEX challenges? 11. Will your event have a theme, within which you can provide one or more challenges? 12. Will you select challenges from those on the Challenges web Page? Will you be inventing your own challenges? Can the User Group help you to think of some good challenges relevant to your particular event? 13. How will you explain the challenge(s) to participants? Verbally? With some form of "Challenge card"? 14. Will your event be a K'NEX competition, with one or more winners? If so, what are your rules for judging going to be, and who is going to select the winner? 15. How many participants do you expect to take part in the K'NEX event? If Open Access, have you considered setting a maximum number of visitors, after which you will put up a "Full" sign to avoid overstretching staff and facilities? 16. How many staff will you need to run the event? Staff ratios between1:8 and 1:20 are usual, depending on the level of support participants need. 17. Will you use existing staff, or recruit new staff for the event (eg student teachers), or both? 18. Will you have staff training requirements? NB User Group can help with training if required. 19. What K'NEX will you need to deliver the challenges you have chosen? Will you need to purchase extra K'NEX or Kid K'NEX (see online shop)? Do you have compartmented trays in which to store the K'NEX? Will you need any other equipment? 21. How do you intend to carry out a risk analysis for the event, and ensure that you have considered all health and safety issues? 22. Will you need any written procedures for the event (eg on introducing the challenge, helping participants get started, assisting participants if they get stuck, assessing completed challenges)? 24. Are there any specific groups you want to target with your marketing? Eg Fathers, participants from deprived areas, teenagers. How will you achieve this? 25. How will you monitor and evaluate the event? Are there statistics that you will need to record about participants (eg gender, age, postcode, ethnic background)? Will you need some form of registration form for participants? Good luck! 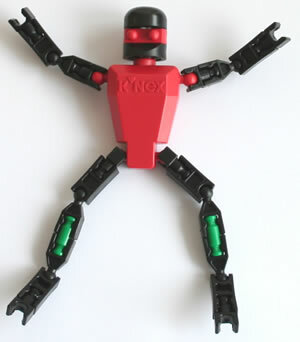 And please email us if you have any queries or suggestions on running K'NEX events. ♦ We would suggest your families work together in groups of 2 or 3 people to use K'NEX, with at least one adult and one child in each group, if possible. This will help them to develop teamwork skills and communication skills whilst they are completing their K'NEX projects. 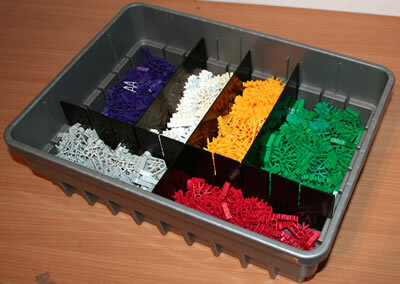 ♦ It will help greatly if you store your K'NEX carefully arranged in compartmented trays, rather than all mixed up in a big box. Many of the K'NEX Education sets now come with trays. ♦ You might like to introduce K'NEX to your families by asking them build a few K'NEX models from instructions. Once they have become familiar with K'NEX-building techniques, it is then recommended that you move on to setting them K'NEX Challenges, so as to maximise the educational benefits. ♦ You may find that some of the children become better at using K'NEX than both their parents and your own staff. Do not worry about this! We suggest your put your star children to work helping out those families who are taking longer to master the K'NEX building skills. We hope the above comments are of some assistance. Please let us have your own ideas on how best to use K'NEX in family learning - sharing good practice is one of our aims. d. The theme of the challenges was "Medieval technology"
2. Each challenge had three levels of difficulty, designed so that all visitors could achieve level 1, and the most able and/or determined could be stretched to complete level 3. 3. Challenge cards for the Castle and Water Wheel challenges may be found on the Challenges page. 4. Most of the K'NEX challenges were completed at tables and chairs in a marquee. 5. The Coracle, Crossbow and Water Wheel challenges were completed outside, sitting on the grass. 6. The event was staffed mainly by student teachers, who gave the families help on request (eg to get started with their challenges). 7. On arrival, families were met at a Reception desk, and each child was given a Passport, listing all the challenges available. 8. The Passport was then date-stamped, to prevent families sneaking in the back way! 9. As a family completed each challenge, a member of staff put a red sticker against that challenge in the Passport of each child in the family, showing the level completed. 10. The use of Passports was a major factor in encouraging families to return on multiple days, and to bring friends and relatives with them. You can download an example of a simple passport on the Free downloads page.